"Delicate melt in your mouth almond coconut cookie. Baker's ammonia (ammonium bicarbonate) is also known as hartshorn. It is an old form of leaving that was mainly used before the arrival of baking powder. 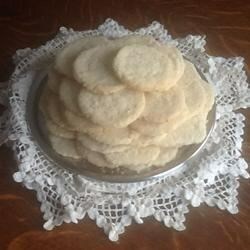 During baking it releases an unpleasant odor, that does not affect the taste of the cookies. It can be found in drugstores and some specialty baking stores"
Preheat oven to 350 degrees F ( 175 degrees C). In a large bowl, cream together shortening and butter. Gradually add sugar and almond extract. Mix on high speed for 10 minutes. In a small bowl, dissolve the baker's ammonia with the boiling water, adding the water a little at a time. Add this to the butter mixture. Stir in the flour and coconut . Mix well. Drop cookies from a teaspoon onto a well greased cookie sheet. Bake cookies in preheated oven for 9 to 11 minutes. Cookies should be set but not brown. Let cookies cool on the cookie sheet for a few minutes before removing. I guess the ammonia must be the magic ingredient. I could not find and substituted baking powder, baking soda, and salt, and the result was the blandest cookie ever. What a wonderful cookie! Sweet, crunchy, and full of the taste of almonds and butter. This should really bring back the use of hartshorn. This was perfect! I served these for our book club discussion of the Swedish book, "My Grandmother told me to tell you she's sorry."